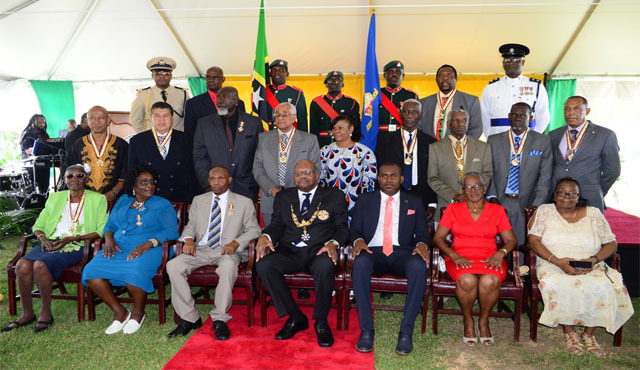 Basseterre, St. Kitts, Thursday, 7th February, 2019, (MyVueNews.com) – Acting Prime Minister, Shawn Richards on Wednesday, thanked some of this country’s most outstanding citizens for the invaluable contributions that they have made to St. Kitts and Nevis, throughout the decades. The occasion was the investiture ceremony at Government House, Basseterre, when sixteen exemplary nationals of St. Kitts and Nevis were invested with the 2018 National Honours Awards for their exceptional contribution to the development of the Federation by His Excellency the Governor-General Sir S.W. Tapley Seaton, on Wednesday. At the ceremony, the Acting Prime Minister congratulated the awardees and thanked them for their meritorious contributions to nation building. Richards, who is the country’s substantive Deputy Prime Minister recited the common quote “give me my flowers while I am still alive” because that is the time they are most enjoyed. “Their good works like flowers, have accentuated the garden of St. Kitts and Nevis, blooming at the right times and filling the air with fragrances of success and creativity,” said Deputy Prime Minister Richards. Present at the ceremony were members of Cabinet including Eugene Hamilton; Vincent Byron Jr.; Ian Patches Liburd; Cabinet Secretary, Josephine Huggins, as well as other senior government officials; Michael Morton, the Governor General’s Deputy, and other specially invited guests.